(Bloomberg) -- For investors trying to make sense of recent extreme moves in the global credit market, bad news: The roller coaster may go on. A glance at bid-ask spreads -- that’s the difference between prices dealers quote to buy and sell -- helps explain the thinking. It’s one way to measure liquidity conditions, which are notoriously difficult to track. The fluctuating spreads could, of course, be a result of the market turmoil. But crucially they and the price moves also occurred against a backdrop of relatively steady fundamentals. Companies in developed markets defaulted at a rate of 1.6 percent in 2018, according to Moody’s Investors Service. That compares with 2.3 percent in the prior year. As for the cause of the liquidity issues, the team at UBS blames the shifting institutional landscape. In the U.S., mutual funds have increased their ownership of credit more than other investor classes, while insurers and pension funds -- which are less reactive -- have moved into assets like private equity and collateralized loan obligations in pursuit of higher returns. 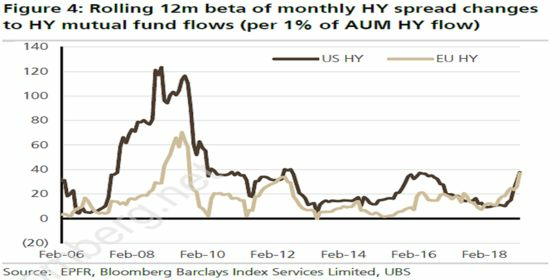 High-yield spreads are moving in tandem with comparatively thin fund flows, according to the report. At the same time dealers, once the market makers who buffered volatility, are also acting like sheep. “Dealer demand is reacting like retail funds, buying when spreads tighten and selling when spreads widen,” UBS said. The bank doesn’t think illiquidity will trigger the market’s next meltdown or end the credit cycle -- in fact they think corporate bonds will keep appreciating for the foreseeable future. But liquidity may be a key factor when the end does come. 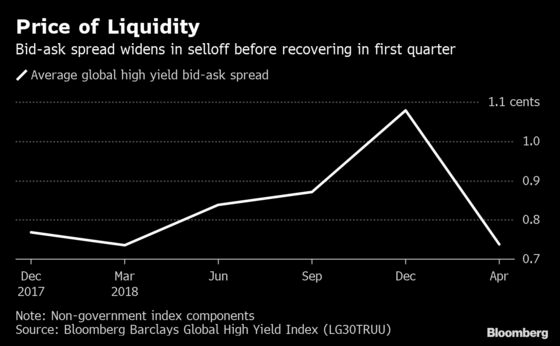 “The real challenge for markets will be when liquidity risk intersects with default risk, which could be the true amplifier to credit risk in a downturn,” they wrote.